You must not load the skip higher than the vertical sides. Yes, all your different types of waste can be placed into the same skip. What materials cannot be placed into one of Fastway’s skips? We are able to allow disposure of many different types of waste in the same skip, apart from some specific materials/items which are listed below. If you are unsure about the type of materials that you can put into our skips, please contact us for advice. The cost of the skip depends on the type of skip and how long that you want it for. Visit our Price List page to give you more of an idea of the type of skip that you will need. Yes, you can put your skip on a public road; however, you are required to possess a council permit beforehand. Fastway Skip Hire will be happy to apply for a permit on your behalf. Which skip size should I hire? The type of skip that you should hire depends on the type and amount of material that you are wanting to dispose of. To make the decision easier, our skip hire pages give you an idea about the number of bin bags that can be placed in each skip. 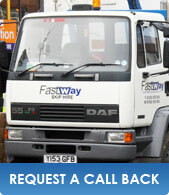 Fastway Skip Hire accepts all major credit or debit card payments over the phone. Payment must be made prior or on the day of the delivery of the skip. Is the Question you were looking for not here?